Towards the end the pregnancy the baby will normally be upside down, and facing your back. 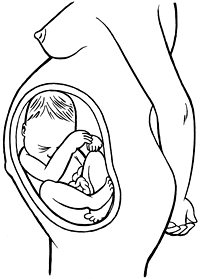 If the baby's head is up it is said to be in breech position, if it is facing your belly, it is said to be posterior. A breech baby has its bottom down and its head up towards the top of the uterus, in other words, it is upside-down. Your baby may be breech when you are six or seven months pregnant, but in most cases they will turn in the final weeks. If your baby does not turn, your doctor can use a technique called an external cephalic version (ECV), where they place their hands on your stomach and use firm pressure to rotate your baby. If this is not successful or the baby turns back to a breech position a caesarean birth is generally considered the safest birth method for the baby, though it may be at the expense of more short-term complications for the mother. Some hospitals have doctors skilled in assisting vaginal breech birth. Speak to your doctor to determine if this might be a suitable option for you. Your baby is said to be in lateral position when the back of their head is facing your side. They are said to be in posterior position when the back of their head is against your spine – so they are facing your belly. Usually the baby will move into a good positon ready for birth, so even in late pregnancy there is not a lot of concern if the baby's position is not quite right. If your baby stays in posterior or lateral positions for the labour it may cause your labour to be a little longer and you may have a bit more back pain. But even in labour your baby is likely to adjust and get into the right position for the birth. Adopting an on-hands-and-knees positon may help with back pain during labour.